Microsoft Dynamics for Distribution | Turnkey Technologies, Inc.
Turnkey has successfully implemented Microsoft Dynamics for Distribution in numerous organizations. Learn how. A wholesaler or distributor needs to be able to manage changes in inventory demand and have the capability to routinely purchase and return stock as necessary. We have deep experience in implementing Microsoft Dynamics GP and CRM for distribution organizations. We can assist you in managing your inventory, controlling costs, integrating with your supply chain and growing your revenue through more efficient practices. Our knowledge of the pain points, operational bottlenecks and software integration potential within the distribution industry make us a go-to partner for distributors in need of Microsoft Dynamics GP. As you work with e-commerce, strategic customer and supplier alliances, supply chain integration and collaboration, and company consolidations due to mergers and acquisitions, we will provide solution expertise to optimize your entire operation, end-to-end. 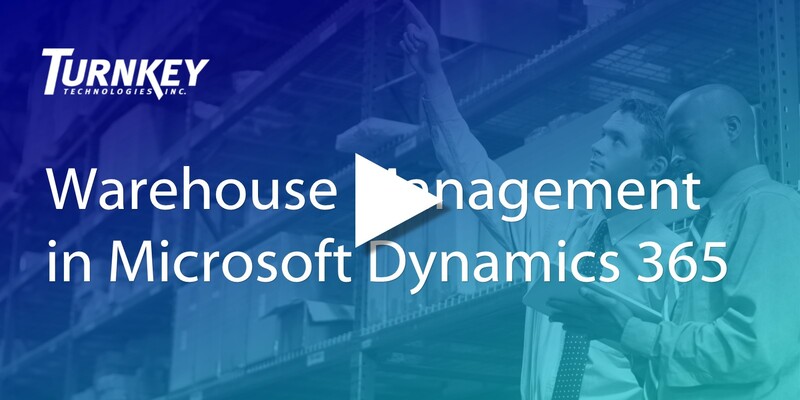 Watch the on-demand webinar and see how to streamline warehouse management processes using Microsoft Dynamics 365 and mobile devices. Enable customer self-service and order tracking. "A customer can log on with their customer number, see their open invoices, pay their bills and do a lot of things that are very positive that you don't normally see with a company of our size. There's no paper involved at all. It all goes back and forth through those systems. Our goal is to see if we can get more partners to buy from us in the same manner." - President, Oaktree Products, Inc.
“There were days when our Turnkey consultant was onsite from 5:00 a.m. to 8:00 p.m. We have always been pleased with Turnkey’s thorough work and devotion to our business. They really care about our overall success." "The Turnkey team is guided by a positive attitude rooted in accountability and tenaciousness. Anytime there was a challenge, they were able to make things work. Their success in this project is thanks to their ability to evaluate our processes and come up with more effective solutions. We are very pleased that they were able to adapt to our needs." "With Microsoft Dynamics GP and expert guidance from Turnkey Technologies, we've transformed a two-week project to a project accomplished in one business day."